this andhra style ginger chutney is also called as allam pachadi or allam chutney. ginger chutney has a sweet, spicy and sour taste and accompanies idli, dosa or steamed rice very well. ginger chutney or allam pachadi or allam chutney recipe with step by step pics. 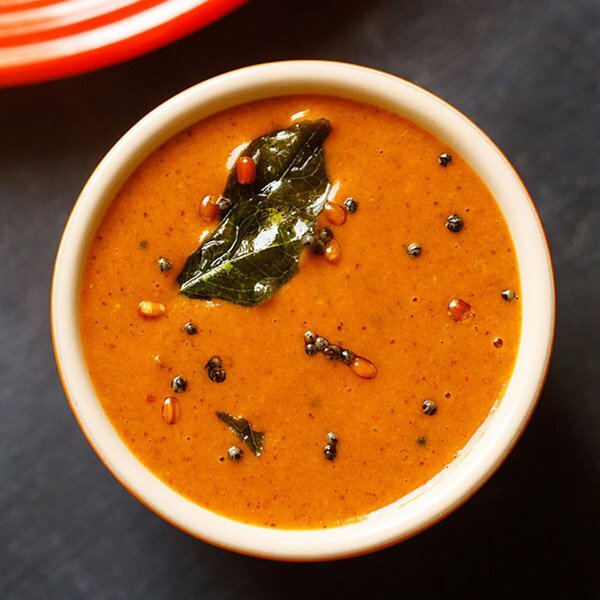 this andhra style ginger chutney is a flavor-packed chutney or dip made with fresh ginger roots. 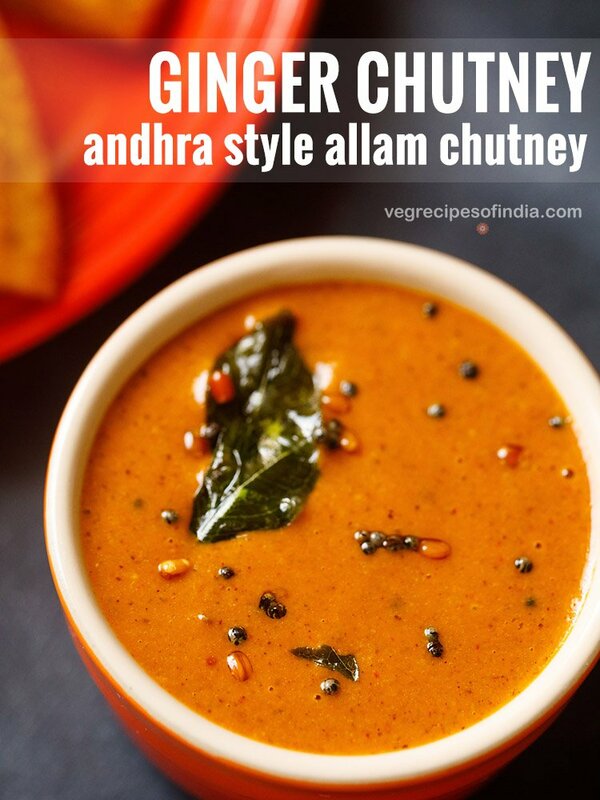 the telugu word for ginger is allam and hence the name allam chutney. 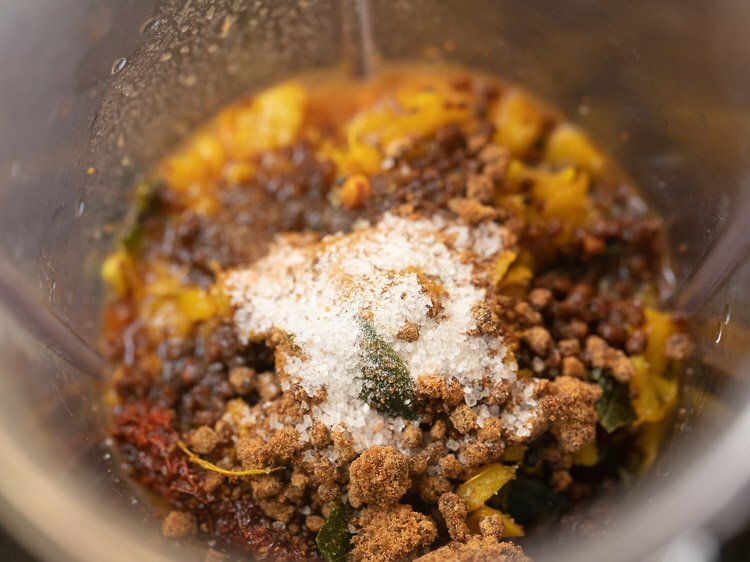 obviously, in this chutney recipe, ginger is the star ingredient but there are also tamarind, red chillies, jaggery and some spices added which balance the pungency of ginger. this ginger chutney has a sweet-sour-spicy taste and goes very well as a side dish with idli, dosa, pesarattu, dibba roti and even rice. 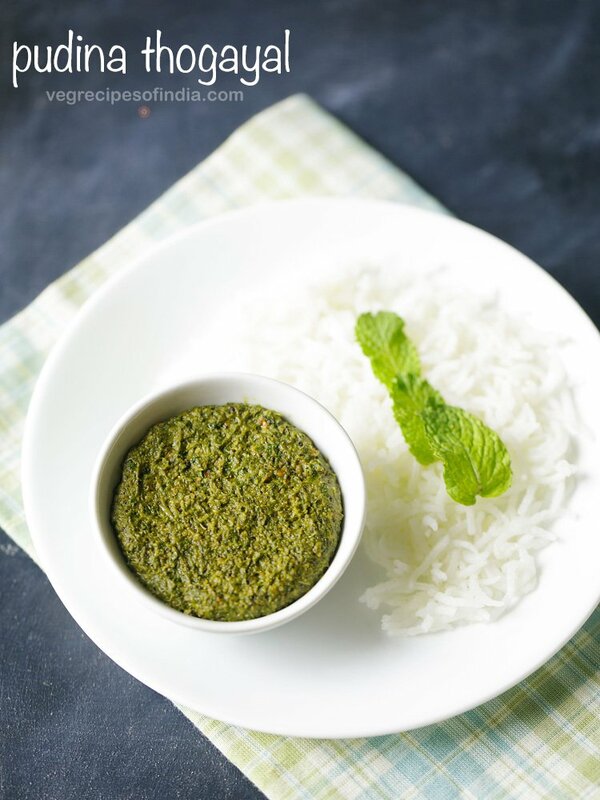 there are some andhra recipes which are a favorite with us and this ginger chutney is one of them. 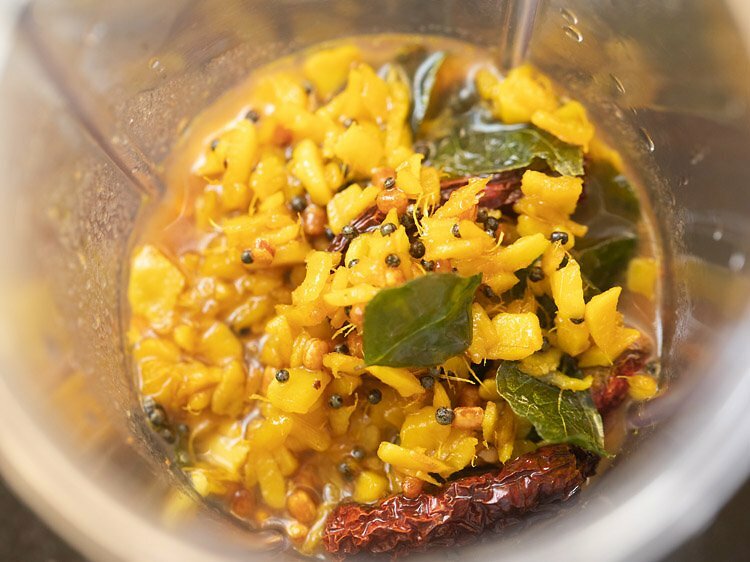 there are many ways a ginger chutney is made. 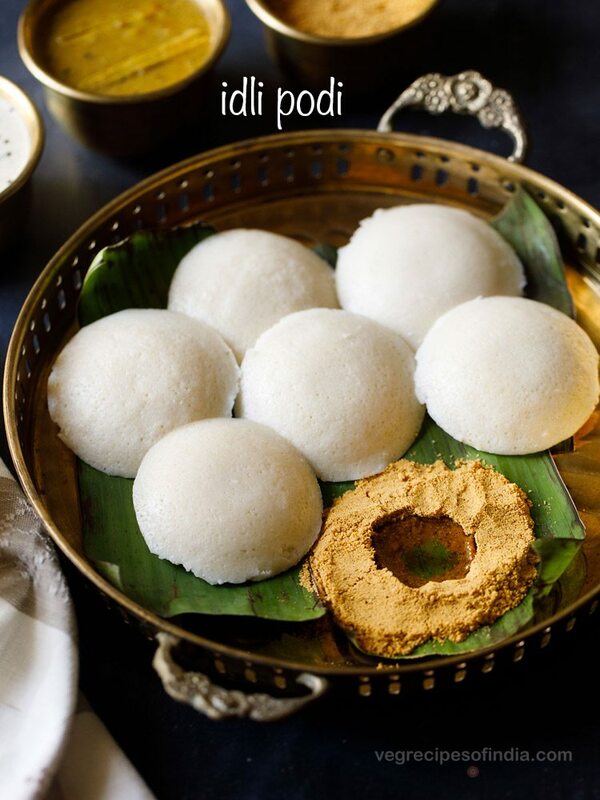 i am sharing the recipe which i make at times to go with idli or dosa. 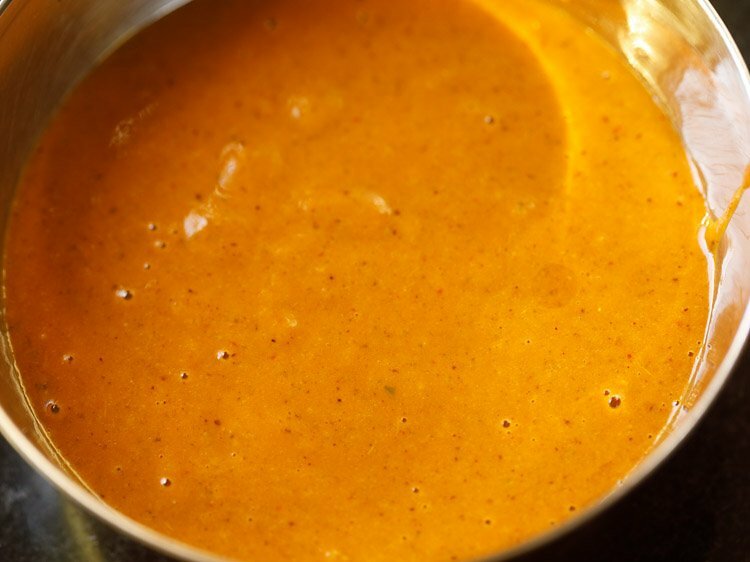 this ginger chutney is a no onion no garlic recipe. ginger chutney is made in a similar way various vegetable chutneys from the south indian cuisine are made. 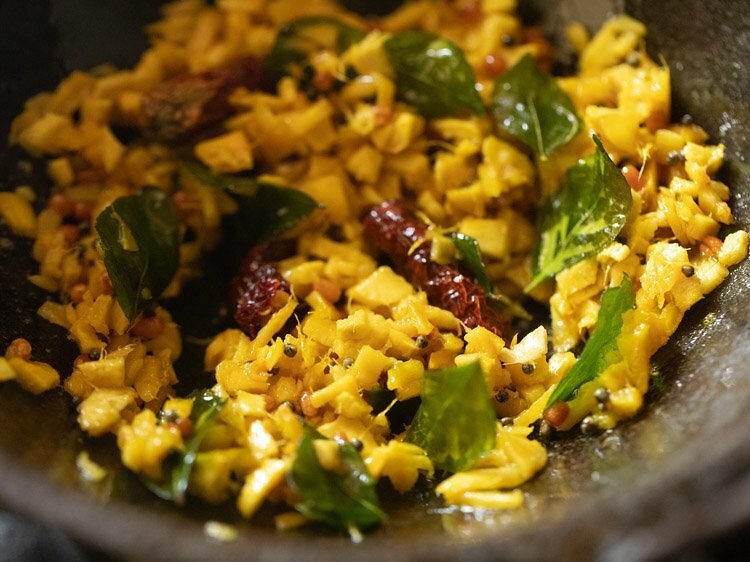 ginger is sauteed with a few spices and then ground with tamarind pulp and jaggery. 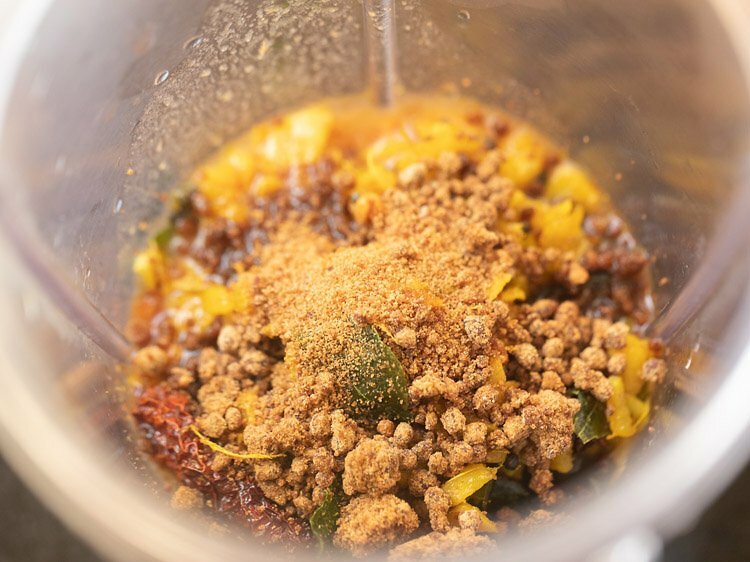 this ground chutney is then later tempered with some spices and herbs. use fresh and tender ginger. avoid ginger which is fibrous and heavy. 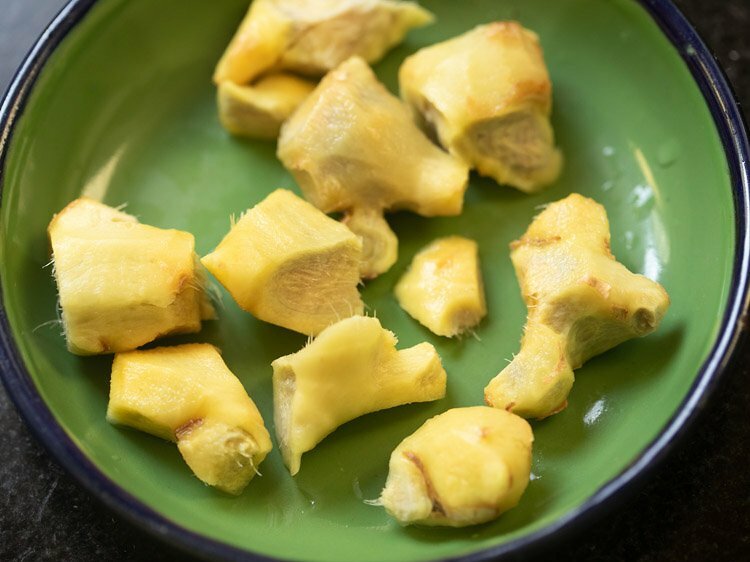 ripe or mature ginger can make the chutney taste bitter. the ginger just need to be sauteed lightly when making this chutney. so you don’t need to brown or overcook the ginger. frying ginger too much can also make the chutney taste bitter. 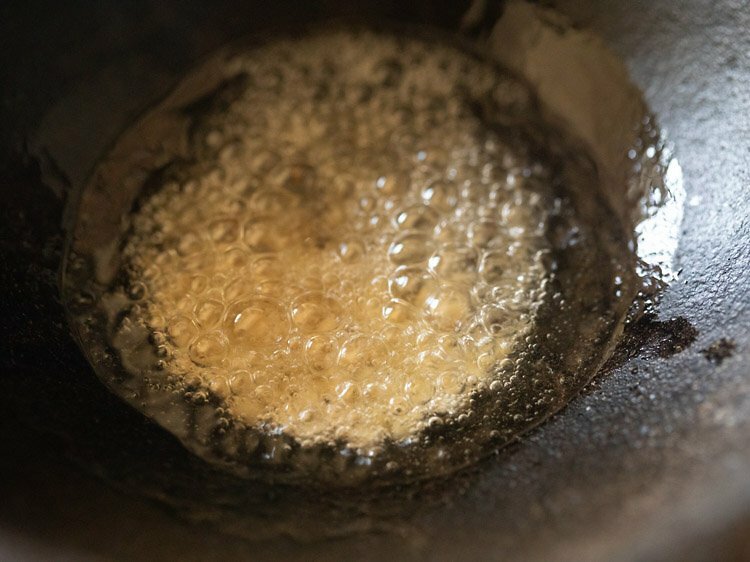 add sugar or unrefined cane sugar or palm sugar or coconut jaggery instead of jaggery. you can skip tempering toward the end and it is an optional step. without tempering also the allam chutney tastes good. you can use sunflower oil or peanut oil or any neutral tasting oil. can ginger chutney recipe be halved or doubled ? tamarind has this typical sour taste that cannot be the same if you use lemon juice or dry mango powder. yet if you do not have tamarind, then you can add lemon juice. add some more tamarind pulp if the chutney becomes bitter. 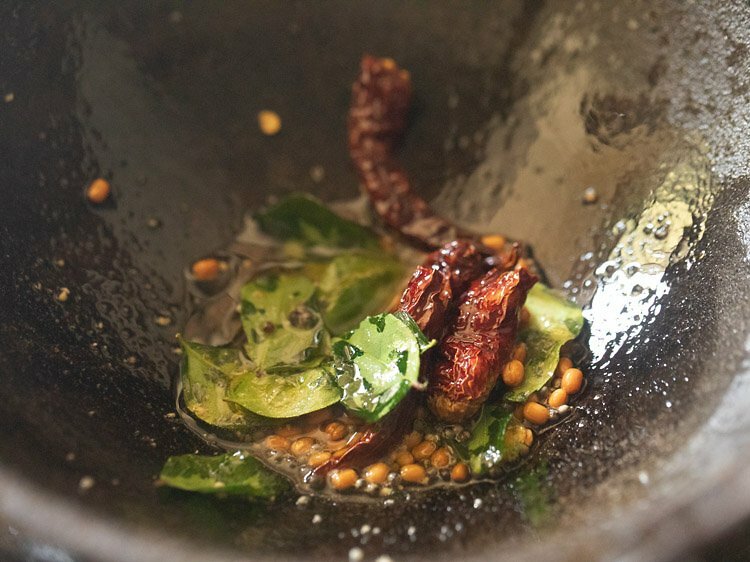 the sourness of the tamarind pulp will balance the bitterness in the ginger chutney. you may also need to add some more jaggery if required. usually, the bitterness is felt for the first day, but after refrigerating the chutney, the bitterness mellow down and you do not get to taste it. leftover chutney can be stored in an air-tight jar in the fridge for 4 to 5 days. 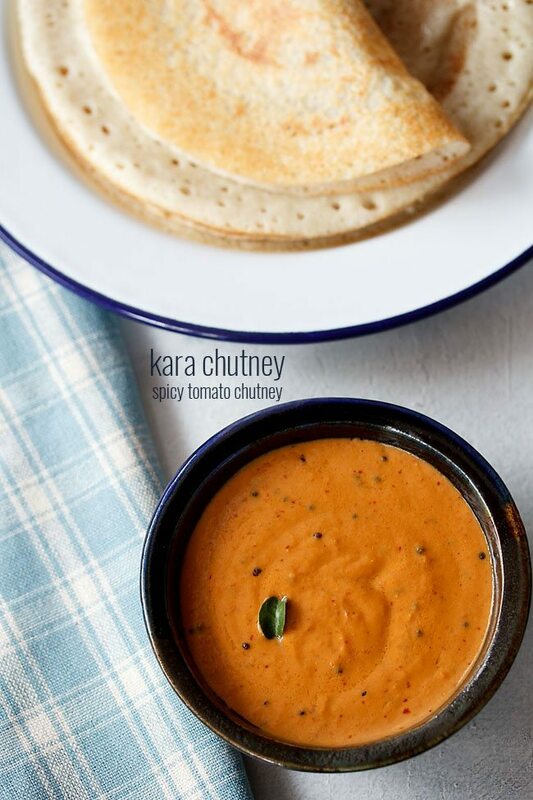 what is served with ginger chutney ? 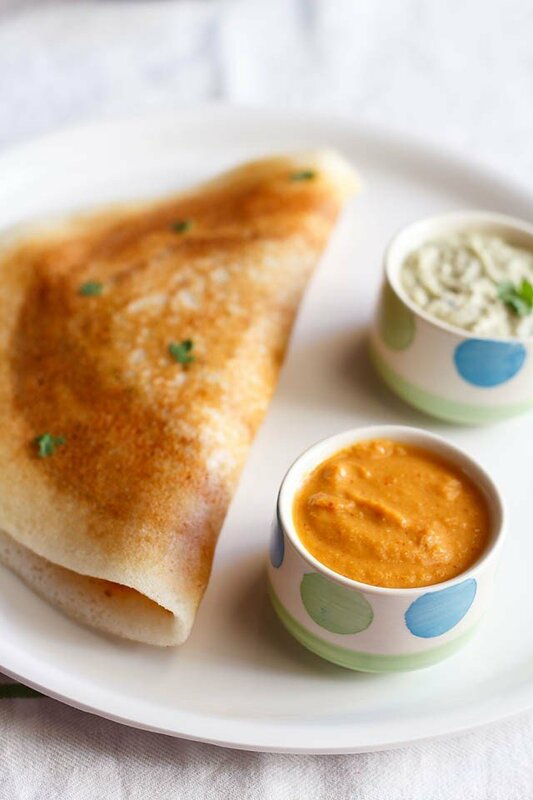 ginger chutney is best served with idli, dosa, set dosa, pesarattu, dibba roti and even medu vada. 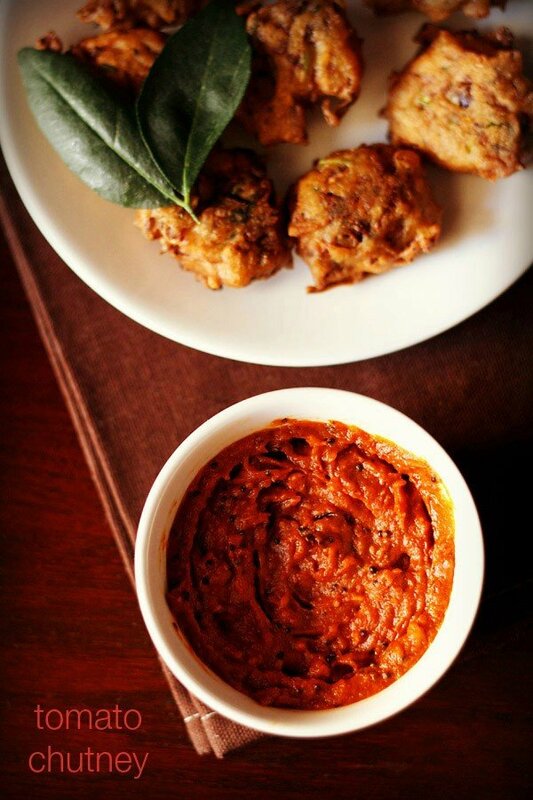 you can also have this chutney with bread or rotis as a side dish. allam pachadi can also be served with steamed rice. take ¼ cup hot water in bowl. place 1 tablespoon tamarind in it. soak tamarind in hot water for 20 to 30 minutes. after 20 to 30 minutes, squeeze the tamarind pulp directly in the bowl containing water. extract as much pulp as you can. keep this tamarind pulp aside. meanwhile rinse 60 grams ginger or 6 to 7 pieces of 2-inch ginger very well in water. peel them. then chop them. you will need ½ cup chopped ginger. keep aside. 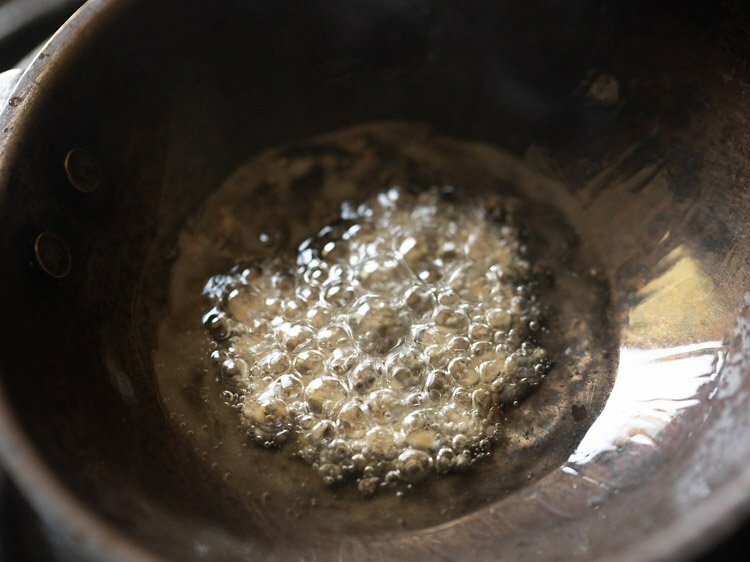 heat 1 tablespoon oil in a small kadai or pan. 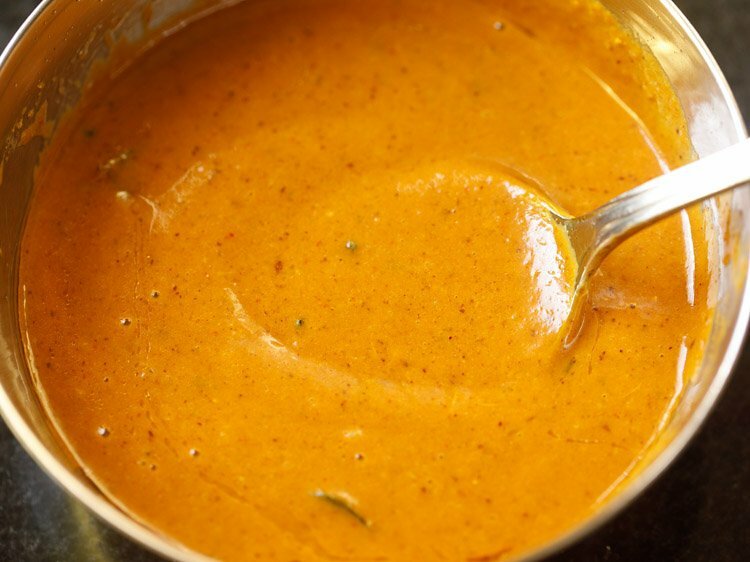 keep flame to low and add ½ teaspoon mustard seeds. let the mustard seeds begin to crackle. when the mustard seeds start crackling then add 1 teaspoon urad dal. 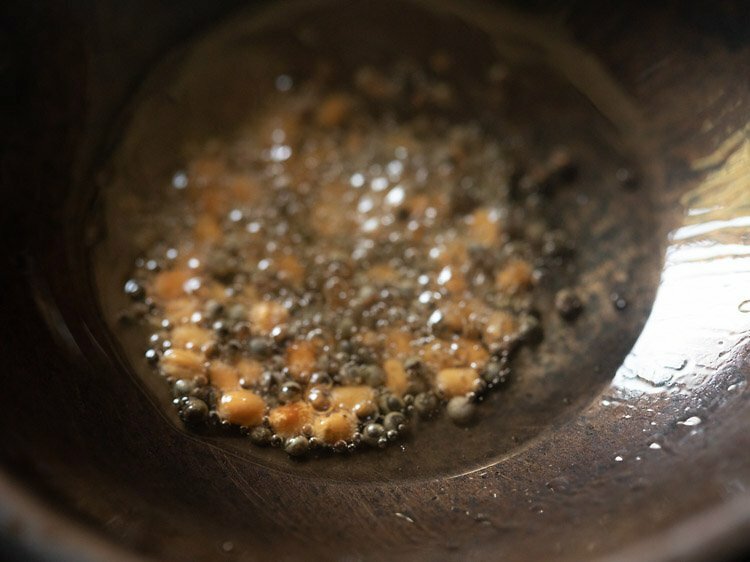 stirring often fry urad dal. fry urad dal till the lentils turn golden. then add 2 dry kashmiri red chillies (broken and seeds removed) and 1 to 2 pinches asafoetida (hing). if the pan becomes too hot, then switch off the flame. 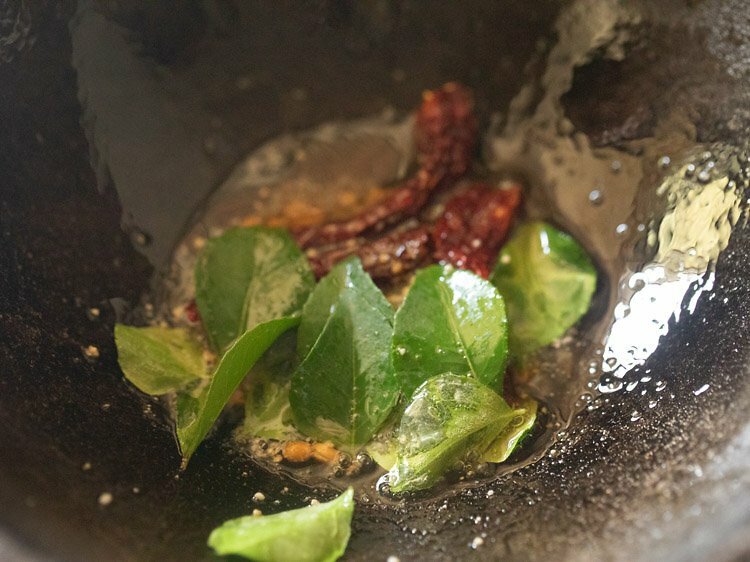 quickly add 10 curry leaves. mix and fry till the red chilies change color. do not burn them. 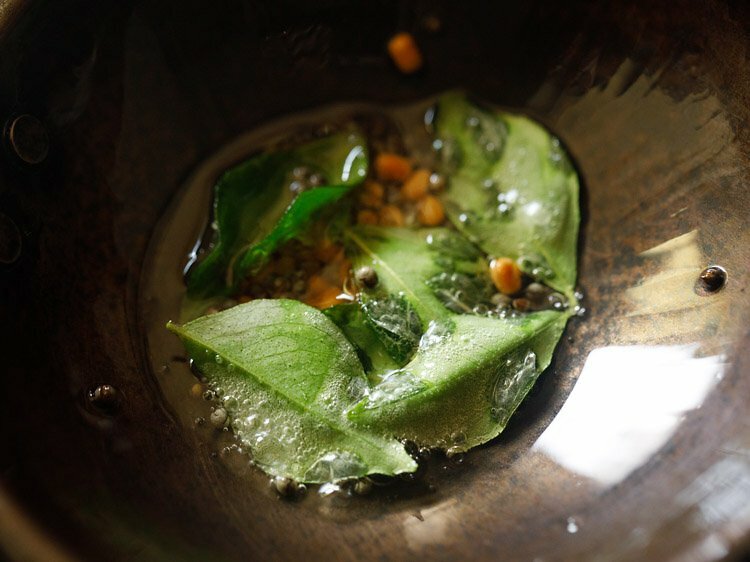 the curry leaves will also become crisp. now add the chopped ginger. mix very well. add 2 pinches turmeric powder. mix again and saute on a low flame. 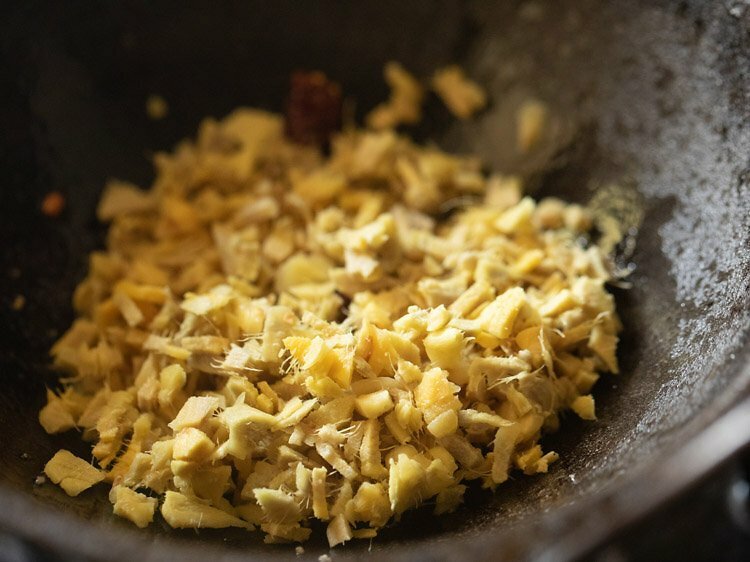 sauté ginger pieces till their raw aroma goes away. do not sauté too much or brown the ginger. switch off the flame and keep the pan on kitchen counter-top. let this allam pachadi mixture cool down or become warm. then place all of the ginger chutney mixture in a grinder-jar. add the tamarind pulp. add 1.5 tablespoons jaggery or add as required. jaggery can be added less or more as per your taste buds and on the quality of tamarind. dark and aged tamarind is sourer and will need more jaggery. add 4 to 5 tablespoons water or as required and grind chutney to a smooth consistency. remove ginger chutney in steel bowl and keep aside. in a tadka pan or a small pan, heat 2 teaspoons oil. keep flame to a low. add ½ teaspoon mustard seeds and let them begin to crackle. as the mustard seeds start crackling, add ½ teaspoon urad dal. 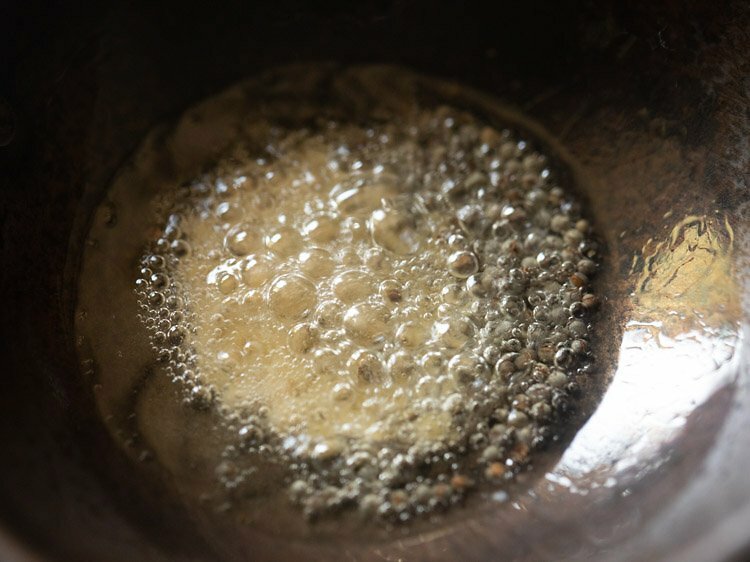 stirring often fry urad dal till they turn golden. then add 5 to 6 curry leaves. stirring often fry them for a few seconds till they become crisp. switch off flame and add the entire tempering mixture to the ginger chutney. mix very well. check for taste of salt and if required you can add more salt in the allam chutney. 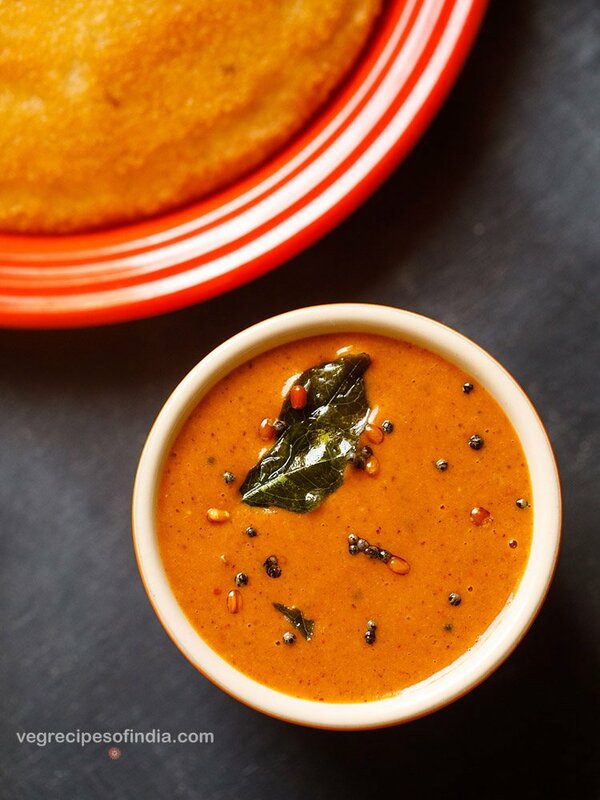 serve ginger chutney or allam pachadi with idli, dosa, pesarrattu or rice. 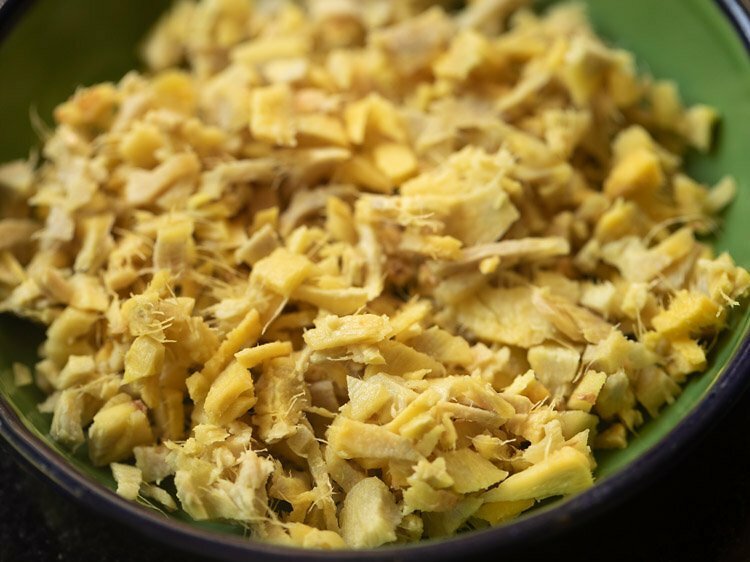 use fresh and tender ginger. avoid ginger which is fibrous and heavy. frying ginger too much can also make the chutney taste bitter. you can add sugar or unrefined cane sugar or palm sugar or coconut jaggery instead of jaggery. you can easily halve or double ginger chutney recipe. if you do not have tamarind, then you can add lemon juice. kashmiri red chillies do not make the chutney too spicy. if you using any other red chillies then add less or more depending on the spiciness in the chillies. 1. take ¼ cup hot water in bowl. place 1 tablespoon tamarind in it. 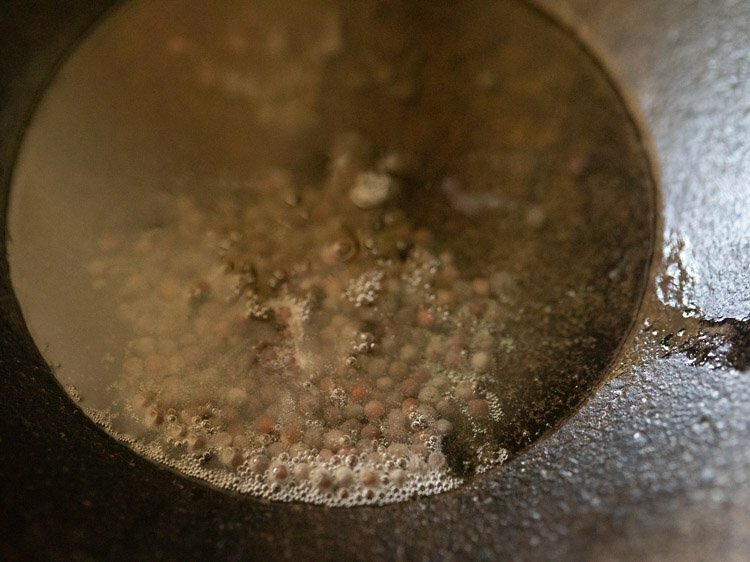 soak tamarind in the hot water for 20 to 30 minutes. 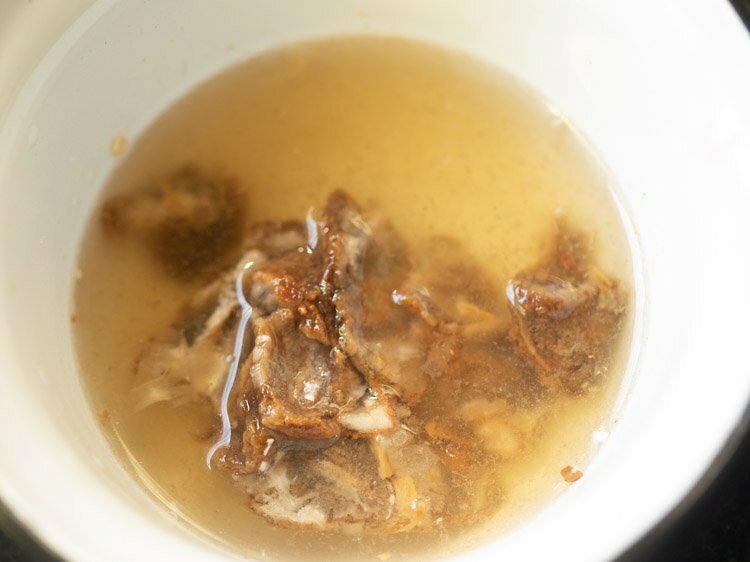 2. after 20 to 30 minutes, squeeze the tamarind pulp directly in the bowl containing water. extract as much pulp as you can. keep this tamarind pulp aside. 3. meanwhile rinse 60 grams ginger or 6 to 7 pieces of 2-inches ginger very well in water. peel them. 4. then chop them. you will need ½ cup chopped ginger. keep aside. 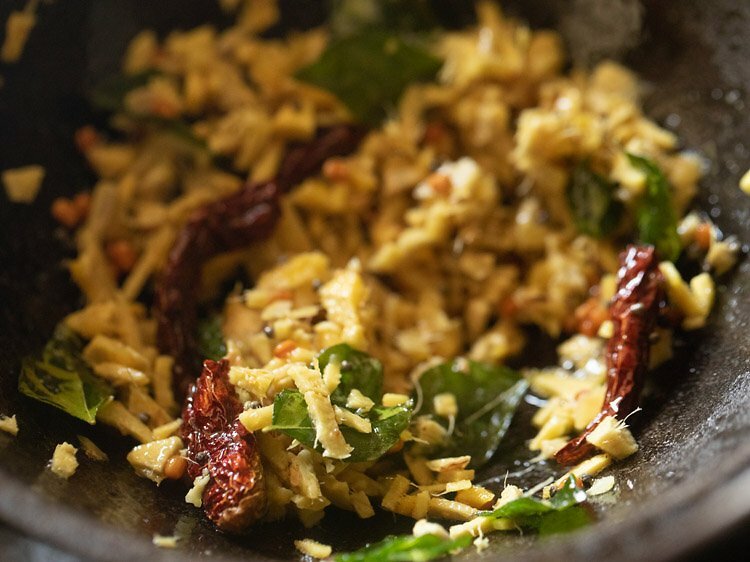 5. heat 1 tablespoon oil in a small kadai or pan. 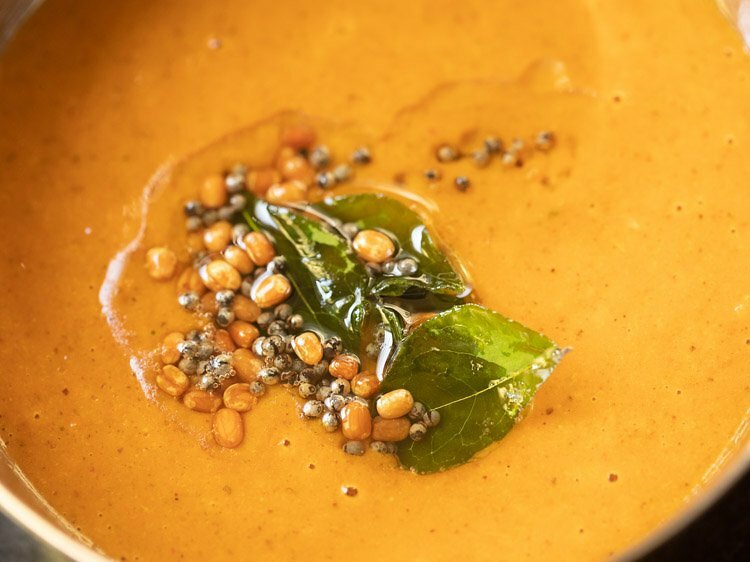 keep flame to low and add ½ teaspoon mustard seeds. let the mustard seeds begin to crackle. 6. when the mustard seeds start crackling then add 1 teaspoon urad dal. 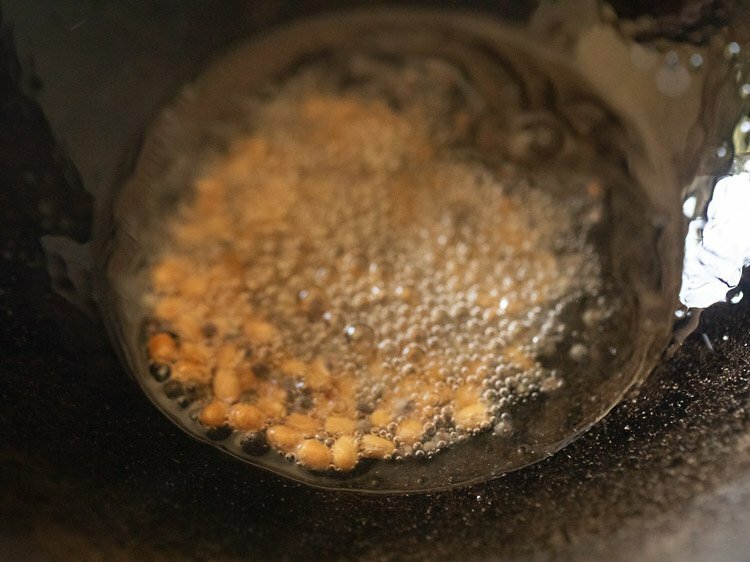 7. stirring often fry urad dal. 8. fry urad dal till the lentils turn golden. 9. then add 2 dry kashmiri red chillies (broken and seeds removed) and 1 to 2 pinches asafoetida (hing). if the pan becomes too hot, then switch off the flame. if using any other type of dry red chilli, then you can add less or more depending on the spiciness of the red chillies. 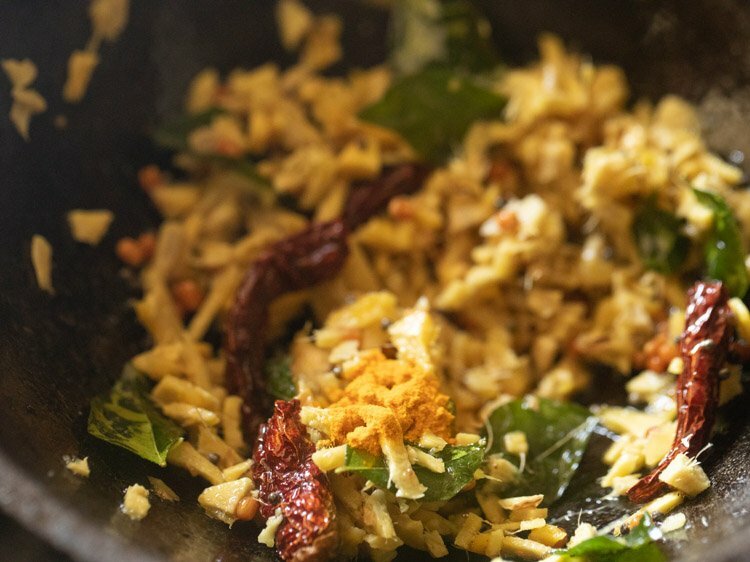 10. quickly add 10 curry leaves. 11. mix and fry for a few seconds till the red chilies change color. do not burn them. the curry leaves will also become crisp. 12. now add the chopped ginger. 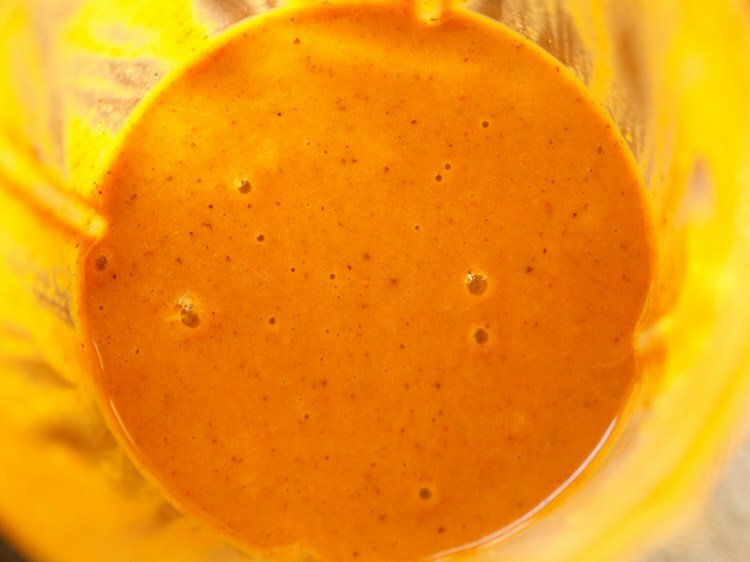 14. add 2 pinches turmeric powder. mix again and saute on a low flame. 15. sauté ginger pieces for 1 to 2 minutes till their raw aroma goes away. do not sauté too much or brown the ginger. 16. switch off the flame and keep the pan on kitchen counter-top. let this allam pachadi mixture cool down or become warm. 17. then place all of the ginger chutney mixture in a grinder-jar. add the tamarind pulp. 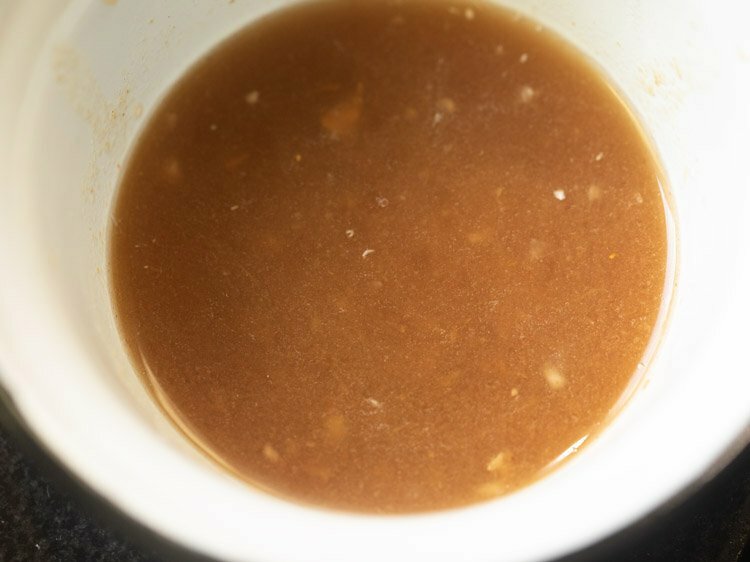 18. add 1.5 tablespoons jaggery or add as required. jaggery can be added less or more as per your taste buds and on the quality of tamarind. dark and aged tamarind is sourer and will need more jaggery. 20. add 4 to 5 tablespoons water or as required and grind chutney to a smooth consistency. 21. remove ginger chutney in steel bowl and keep aside. 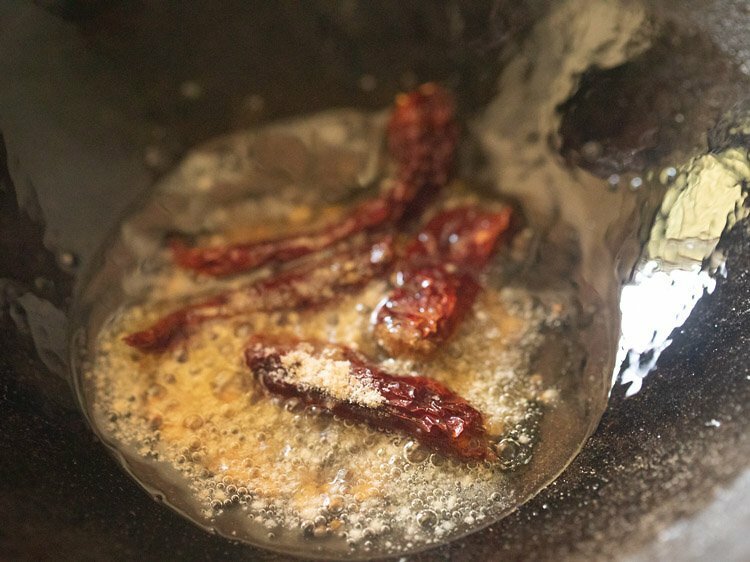 22. in a tadka pan or a small pan, heat 2 teaspoons oil. keep flame to a low. add ½ teaspoon mustard seeds and let them begin to crackle. 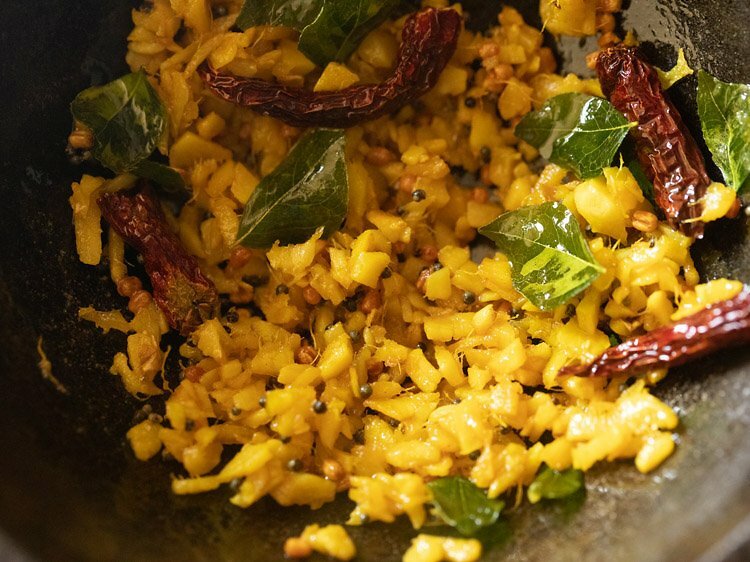 23. as the mustard seeds start crackling, add ½ teaspoon urad dal. 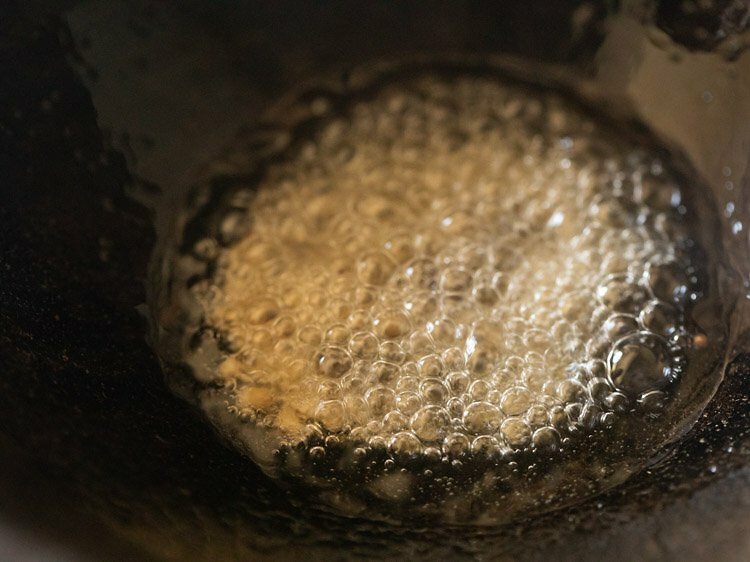 24. stirring often fry urad dal till they turn golden. 25. then add 5 to 6 curry leaves. stirring often fry them for a few seconds till they become crisp. 26. switch off flame and add the entire tempering mixture to the ginger chutney. 27. mix very well. check for taste of salt and if required you can add more salt in the allam chutney. 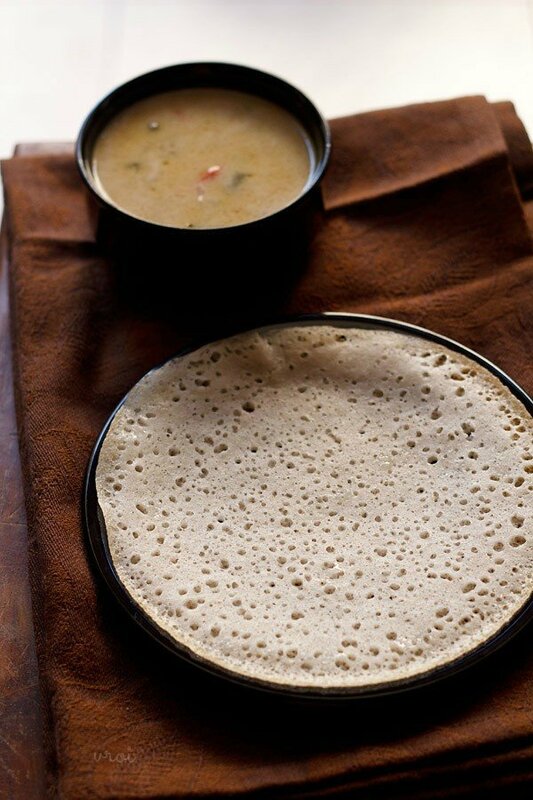 28. serve ginger chutney with idli, dosa, pesarattu or rice. i know meveera. yesterday night after checking the post on mobile, i realised it. have added it know. but thanks for letting me know.